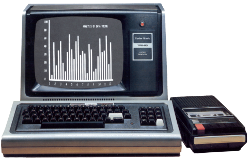 This page covers the modern hardware which can be used to replace Floppy Drives in a real TRS-80. The SDCard HxC Floppy Emulator designed by Jean-François Del Nero, emulates a 34 pin floppy drive and treats DSK and DMK images which are stored on a SD card as actually floppy disks. To be clear, this product is designed to be mounted in/on an actual TRS-80, as a drive on the floppy cable. It can emulate one or two drives, and disk images are mounted using the three buttons on the lower right, which are NEXT, SELECT/EJECT, and PREVIOUS. The filenames are shown on the LCD, which comes in a variety of colors. Write support: ISO MFM 256/512/1024 Bytes sector write supported, ISO FM/SD 128/256/512/1024 Bytes sector write supported. Tracks / Side support: Up to 256 tracks per floppy, 1 or 2 sides. The documentation can be found here and the changelog can be found here.